From the mind behind 5 Centimeters a Second and Voices From a Distant Star, which I consider one of the best films I've ever seen. comes Garden of Words a simple romance rendered in a breath taking visual style. This is a short romance, its only about 45 minutes, that largely didn't click with me. The pacing seems off with a great deal of time spent with the pair talking in the gazebo. That would be all well and good but when the film shifts gears and we see the young man at school and venturing to the lady's house things seem rushed. We jump to a conclusion, of sorts, for my money the film doesn't so much end as stop. I know you're wondering why I'm writing the film up when it sounds like I'm not really thrilled with the film, well simply put the film is a visual delight. Yes its all animation, but it's so beautifully done that it becomes almost more real then real. The park scenes were all created based on photographs of an actual park. 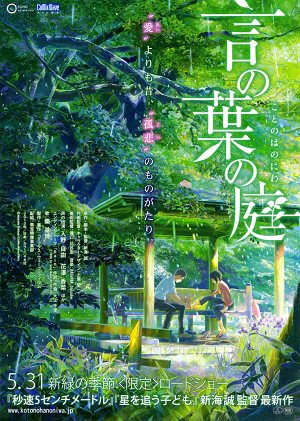 I know all of the sother locations have real life counter parts, but under the watchful eye of director Makoto Shinkai the film takes on another worldly feel as if we are experiencing the world as a treasured memory. Its amazing. If you can see this in HD and on a big screen I recommend it. You think our Tribeca coverage is done? Hell no.